Thank you for visiting the Pittsburgh Sweet Treat Shop located at 800 Mount Royal Boulevard, Pittsburgh, PA 15223. We offer our fresh items in a friendly and welcoming atmosphere. During your visit to our sweet shop or online menu, you will discover a menu of conventional and unique items. 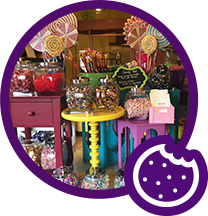 A visit to our sweet shop offers items for your immediate enjoyment. 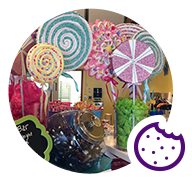 Old fashion and novelty candy, coffee produced by Ohiopyle Coffee Roasters, select hot and iced teas, vintage soda, and more compliment our baked items. 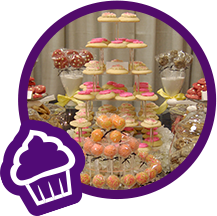 In addition, our sweet shop offers our weekly “Dessert Experience” where you have the opportunity to be engaged by designing your own assortment of items including cupcakes, cake pops, donuts, crepes, and more. In need of unique treat items for your home or office gathering? Consider our pre-order service. Simply view our menu, order online or call, and your items will be prepared fresh, made to order. We look forward to welcoming you to our sweet shop!